Pilaf is a tasty main course. 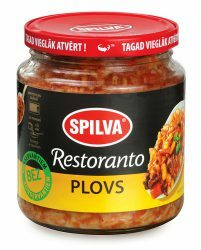 It consists of rise, pork meat, carrots, onions and tomato paste. From one jar it is possible to prepare a meal for two people. Prepare the meal by warming it up for 4-5 minutes on frying-pan or in a microwave. Product is packed in 0,58 l glass jars. Shelf life non-opened – 24 months. Energy value: Per 100 g – 113,5 kcal (478,5 kJ) Nutritional value: Carbohydrates 17,5 g, Protein 3,9 g, Fat 3,1 g.